When I lived in Washington DC, I had a British colleague who often spoiled us with her home cooking. She would put food on a fancy platter lined with "paper lace" (a.k.a. paper doily) and then go around offering everyone a nibble or two. There were meals that she’d go all out for and they were excellent; other days she’d come up with "quickie" meals. I’d ask her, "Ushi, how did you make this?" Her answer: "oh I just bung them all together." The word "bung" stayed with me. Maybe she meant to say "bang" but I distinctly remember the "uh" sound when she’d say "I just BUNG them all together." Here’s a not-very-fancy rice dish that I put together by scavenging for leftovers in my fridge: green seedless olives, Hungarian hot salami, green bell peppers, and sun-dried tomatoes. The rice I use is one day old rice. It would be more difficult to make fried rice when it’s fresh from the pot. What I do is I take the leftover rice and store it in the fridge overnight. The next morning I separate them with a fork – hard manual labor you bet – but definitely worth it. I’m just teasing. Separating the rice with a fork or masher is a no-brainer. Takes 2 minutes – depending of course on how much rice you have. After all the rice is separated, I heat a bit of oil in my fryer and throw the rice in. Make sure your other ingredients are all cut up and ready. After two minutes of swishing the rice around at medium heat, throw in your olives, peppers, salami and sun-dried tomatoes. If I had some sesame oil in the cupboard, I’d probably sprinkle a few drops on the dish right before serving. 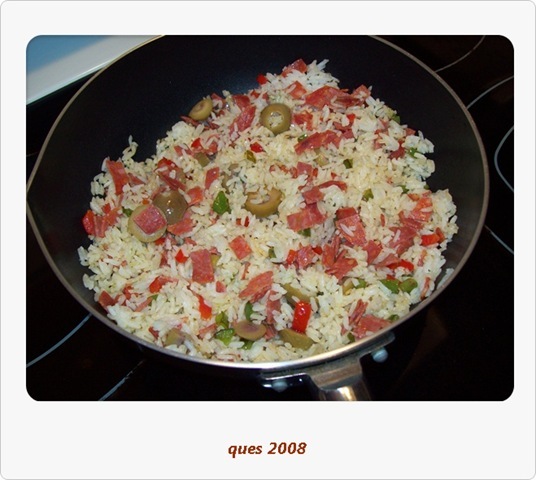 You can make your own rice dish by using cut up sausages, green onions, and yellow/green bell peppers for color. Kalamata olives are also a good bet. Next time, I think I’ll crush some peanuts and sprinkle them over the rice before serving, including a handful of bean sprouts to give the dish that zingy crunch. LOL, Seriously I’m laughing out loud! , “to bung something together” is a VERY well known anglo-saxen term that is widely used in the UK, Australia and New Zealand. “bang together” just ISN’T a good substitute at all and just WON’T do LOL !!! What a loyal reader you are; delighted to have you back! As you might have guessed I haven’t blogged in awhile. I shall visit your blog which I also haven’t done in awhile. Work keeps me on my toes!